Non-Surgical Spinal Decompression is a non-invasive treatment for patients who suffer from neck and back problems. A decompression treatment slowly and gently lengthens or releases pressure in the spine through repetitive movements by a customized treatment table. The table pulls and releases, creating a pressure change within the invertebral disc, surrounding soft tissue, and joints. Rehydration of the disc and surrounding structures creates a physiological change which assists the body’s natural healing process. Patients typically experience significant improvement within 20-25 treatments. Research suggests that continued improvement is seen up to four years following decompression treatment program. 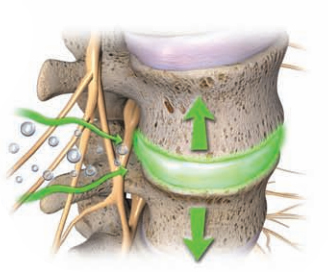 This pressure change allows the disc bulges or herniations and nutrients to be pulled back into the disc. Ongoing lower back or neck pain that is not responding to traditional spinal treatment by a M.D., D.O., D.C. or P.T. Spinal Decompression Therapy treats Neck and Back Pain related to Degenerative Disc Disease, Disc Herniations or Bulges, as well as Sciatic Pain. If you have been diagnosed with sciatica, a bulging disc or chronic back or neck pain, spinal decompression therapy can help. This revolutionary therapy is different from traditional medical treatments that rely on medication to “cover up” pain. Decompression therapy is a drug-free, non-invasive alternative to back surgery and prescription painkillers. Through the logarithmic stretch and release protocols of the decompression procedure, negative pressure is created in the disc over time. This vacuum effect draws any herniated disc material back into the disc. By reversing the effects of axial load or compression in the spine, increased circulation occurs which aids in the healing process. 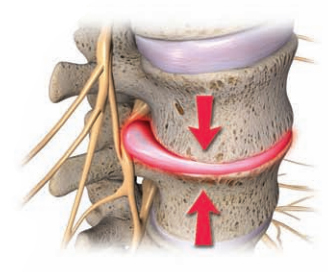 When a herniated or bulging disc slips out of alignment, it may compress nearby nerves. This compression can block the nerves from properly sending and receiving messages from the central nervous system and brain, leading to chronic pain. As long as this compression continues, patients will suffer pain. Spinal decompression therapy creates space between the different vertebrae, providing room for the herniated or bulging disc to return to its proper space in the spine. This relieves pressure on the nerves. At Stanlick Chiropractic, our Murfreesboro chiropractor is committed to helping each patient live an active, pain-free life. If you suffer from back or neck pain, then spinal decompression therapy is the first step back to wellness. Rather than masking your pain, this treatment works by addressing the underlying causes. During a decompression therapy treatment, the patient is securely strapped onto a table lying down. A computerized program controls the table, moving it at precise intervals to gently create space in the spine. Many patients experience significant relief after only one treatment. A series of 20-24 treatments over several weeks typically produces the best long-term results. Every patient is different, however, so we will tailor the treatment to your individual needs. You may benefit from additional sessions or only need a few to start feeling healthy again. Spinal decompression therapy is an effective treatment for spinal stenosis, sciatica, and bulging and herniated discs. If you are struggling with chronic pain from failed back surgery, this treatment can also help. We frequently incorporate spinal decompression therapy into injury rehabilitation treatments for car accident injuries, such as whiplash, and sports injuries. Depending on your pain management and injury rehabilitation needs, we may also combine spinal decompression treatments with corrective exercises, physical therapy and chiropractic care. Our goal is to support and accelerate the healing process while naturally relieving back and neck pain. Murfreesboro sciatica, back and neck pain patients choose spinal decompression therapy because it is a long-term, effective solution that really works. By addressing the mechanical misalignment in your back, our chiropractor helps to correct the underlying cause for pain. If you are considering surgery to cope with your back pain, we urge you to try decompression therapy first. Professional athletes have used this treatment successfully for years to manage chronic pain due to back injuries. We are excited to now offer this life-changing treatment to our patients. Simply choose a date and time below, or call our office (615-267-3377) to schedule your preferred time. Our office will contact you to confirm your appointment time. We look forward to meeting you! Don’t live with chronic back pain for the rest of your life. Spinal Decompression can get you back on track to wellness. When we opened in 2004, we committed ourselves to being the finest chiropractor in the Murfreesboro area. As a reflection of our physical location in the heart of Murfreesboro, we believe that healthy people and communities start from a core of well-being that radiates health outward.